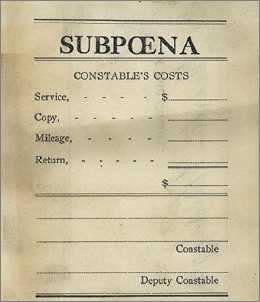 So last week The Legal Genealogist tackled the question of service of process — the notion that somebody has to be given a copy of the documents that require an appearance in court. It’s a particularly great question because it lets me give the answer I love best. As with so many other issues that guide us in understanding and using legal records in genealogy, this one comes down to a matter of figuring out what the law was at the time the record was created in the place where the record was created. And every state’s law is going to be different, and may well be different from one time in that state’s history to another. In most cases, the process-serving authority of a public official — the constable or sheriff who was supposed to deliver the documents — stopped at the borders of the jurisdiction he served. That could be a county; it could be an even smaller part of a county. All that variation — and that’s just one set of statutes, in one state, in one year! So the answer to Jill’s question is: it depends, on the law of the time and place, and it can vary depending on the kind of case and even the kind of court where the process itself was issued. Thanks for the great question, Jill!